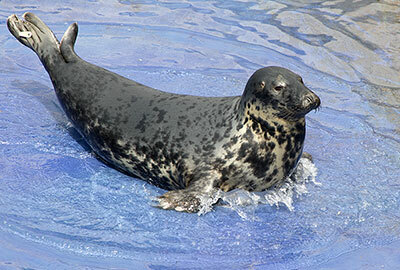 Aayla was rescued on the Norfolk coast in January last year weak from hunger and with a small wound to her front right flipper. 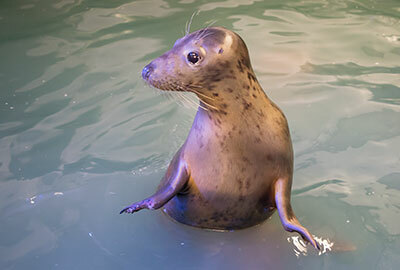 She was cared for at Sea Life Hunstanton, where a detailed vet´ inspection revealed that infection in her wound had spread to the bones of her flipper. "The only way to prevent the infection from spreading was to amputate the affected bones," explained Sanctuary curator Tamara Cooper. "She has recovered well but is being monitored closely and may require more surgery in the future." Having outgrown Hunstanton´s outdoor pool, Aayla was in urgent need of a more spacious, permanent home. "We have two female greys of similar age, Jinx and Willow," said Tamara, "so Aayla will be joining them and we´re delighted to have her." 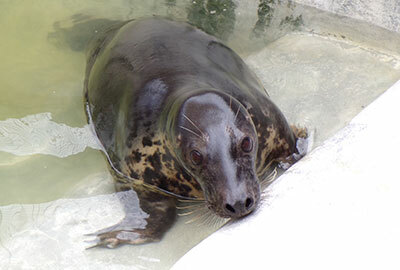 Aayla arrived at the Sanctuary on Tuesday afternoon (17th July 2018) and is currently acclimatising in a nursery pool before joining the other females next week. "She and Jinx and Willow have already been barking greetings at each other across the intervening pools, so the signs are good that they will get along famously." 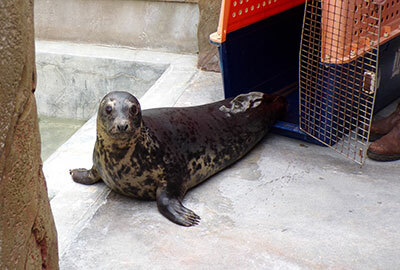 Aayla´s arrival just before the school holidays will be a welcome bonus for the thousands of summer visitors to the Sanctuary, who will be sad to learn about her injury but no doubt happy to see her enjoying good company and being well cared for. Aayla is the first permanent new resident to arrive at the Sanctuary since it was taken over in March 2018 by marine conservation charity the Sea Life Trust, which has since also announced plans to develop the world´s first Beluga Whale Sanctuary in Iceland.